But despite this recognition of the importance of historic preservation, our city has once again gone through a contentious debate trying to find a balance between new development and historic preservation. This time, the debate involved the former Central Bank Building (dating from 1912) and the adjacent Pheil Hotel and Theater (dating from 1917), the city’s first skyscraper, on the 400 block of Central. The matter was complicated and involved, and we will not recount the specifics here. Rather, we should be thankful the matter ended with a win-win, with Saint Petersburg Preservation withdrawing its court challenge of the process and its application to designate the buildings local historic landmarks, and the City and building owners committing to significant mitigation-like measures the basics of which are summarized in the sidebar. It is great to see this willingness to reason and come together for the betterment of our city. 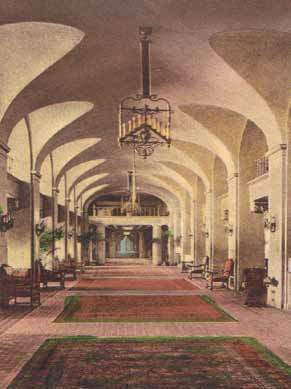 Lobby of the Historic Vinoy Renaissance Hotel. The Vinoy Hotel dates from 1925. It was closed in 1974/75, and reopened after 17 years in 1992. The interior was meticulously restored. Hand-colored postcard, circa 1930. In order to foster our city’s specialness, the City has established various incentives. With respect to development, local property tax exemptions and reduced impact fees in certain areas of the city are offered. (There are also many additional state and federal incentive programs.) In the case of historic properties, incentives include reduced property taxes for approved renovations, and in the downtown area, sale of development rights. At the federal level, tax credits are offered for commercial property designated as historic. The City’s recent revision of the preservation ordinance further enhanced local incentives for historic preservation by removing the previous cap on the property tax exemption allowed for renovations. For the first time, this allows an exemption for new additions such as a guest cottage, so long as these are compatible with the historic character of the associated home or other structure. Also, the potential volume of development right credits which may be sold was reduced, thus enhancing the value of those remaining. Additionally, historic properties are exempt from certain code and flood requirements. Only changes to the exterior of historic properties require prior City approval; owners are free to make whatever changes they wish to the property interior (so long as these meet normal City code). 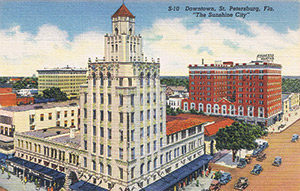 But, as significant as these measures are, further steps need be taken to foster our city’s development and yet maintain its built heritage and character – to “keep St. Pete special.” In 2005, Mayor Rick Baker requested from City staff a listing of properties that were potentially eligible for historic landmark designation. The staff prepared a list of 55 such properties which was approved by the mayor in January 2006. Most of these properties were in the downtown area. Mayor Baker then hosted an ‘Historic Preservation Summit’ for purposes of educating the public regarding the benefits, assistance available, and responsibilities of landmark ownership. Both owners of existing landmarks and those on the list of potentially eligible landmarks were specifically invited to attend the summit along with the general public. Also a downtown walking tour map was created, focusing on existing and potential landmarks. Aerial view of the Historic Vinoy Renaissance Hotel. 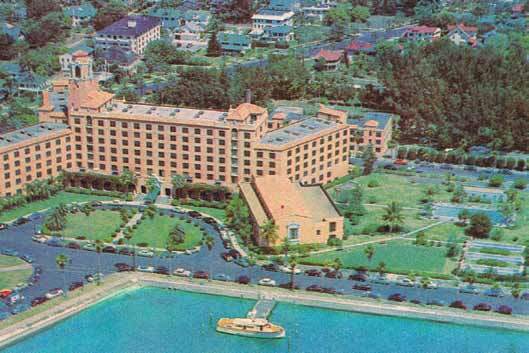 The Vinoy Hotel was named to the National Register of Historic Places in 1978, making it possible for investors to obtain federal tax breaks up to 25% of the cost of restoration. In 1986, the hotel was also designated a local landmark. 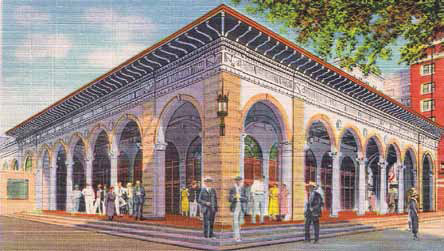 The restoration of the Vinoy is widely credited with playing a major role in sparking the downtown renaissance. Circa 1955. Since 2006, of the 55 potentially eligible properties identified, ten have been designated as landmarks, and three have been considered but denied. (These include the Central Bank and Pheil buildings.) Reasons for this slow pace, in part, have to do with past city policies and limited resources. While properties may be designated in exceptional circumstances without owner consent, City and Saint Petersburg Preservation much prefer to accomplish landmarkings with the consent of owners. The City’s Comprehensive Plan calls for the registry of potentially eligible properties to be updated annually, but that has not occurred and consequently the listing has not been updated for ten years. 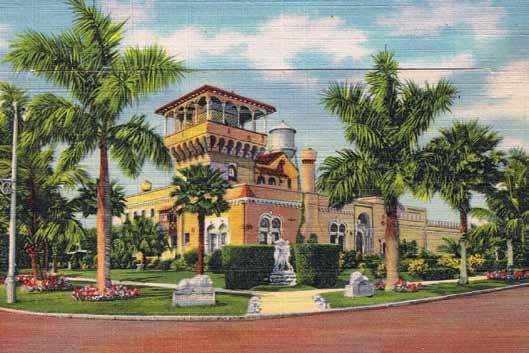 The Sunset Golf & Country Club on Snell Isle – now the Vinoy Renaissance Golf Club – was constructed in 1926 by C. Perry Snell. It was built in the Romantic Revival style with an onion dome, tile detailing, and minaret. The building was designated a local landmark in 1994. Circa 1930. The registry simply serves as a listing of those properties that should be considered for future landmarking. There are no restrictions on improving or altering any building on the listing. The only restriction is that should a request for a demolition permit be submitted, it is held for 30 days to provide the City and other interested parties an opportunity to accomplish a review of the relative historic importance of the property, and to possibly submit an application requesting that the building be designated a city landmark. The City Planning and Preservation Commission (CPPC) recently called for establishment of a task force to update the registry. An updated registry should encompass the entire city and not be limited to downtown. Historic preservation is of city-wide importance, not just a downtown matter. It is understood that the task force will be composed of a range of stakeholders in order to accomplish a well-founded updated registry. These stakeholders would logically include such groups as Saint Petersburg Preservation, the Chamber of Commerce, the Council of Neighborhood Associations, the American Institute of Architects, and representatives of owners of both established and potentially eligible landmarks. 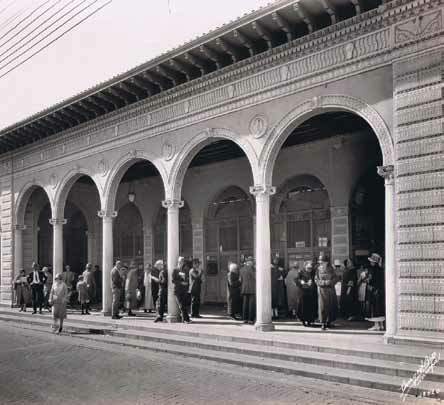 This photos of the Open-Air Post Office was taken March 29, 1926. It must have been an unusually cold day for March. Check-out the overcoats. Hopefully the task force will go one step further. What is needed is not simply a register of potentially eligible properties, but also some prioritization of which properties should be considered for landmarking first, or at least which are most important. Given such prioritization, the City and groups such as Saint Petersburg Preservation can better focus their limited resources. Significant time and expertise are required to undertake the research needed to complete the application and documentation required for designating a building as an historic landmark. As part of the recent agreement between the City and Saint Petersburg Preservation, the mayor has reaffirmed the previous city policy of seeking to initiate the designation of at least three buildings as new historic landmarks yearly – a standard that has seldom been achieved in recent years. A prioritized listing of potential landmarks will help direct that effort. Saint Petersburg Preservation’s new preservation fund might also be tapped to support this effort. Dating from 1916, the Open-Air Post Office was designed by Postmaster Roy S. Hanna and architect George Stuart. The post office was added to the National Register of Historic Places in 1975 and designated a local landmark in 1986. This postcard’s obverse notes “tremendous” post office business conducted during the winter months “when the city has 300,000 winter visitors, many times its normal population.” Circa 1930. Accomplishment of an updated and prioritized registry of potentially eligible historic landmarks should be of great assistance, particularly to the development community, as well as persons simply seeking new homes. Buyers of landmarks or potential landmarks need to be aware of both the benefits and responsibilities of ownership. Given some basic agreement on what properties are most important to our history and city character, future conflicts between development and preservation at least may be minimized. All interested parties will benefit from a clearer understanding of both preservation and development opportunities. Part of the recent agreement between the mayor and St. Petersburg Preservation also calls for a new Preservation Summit before year’s end. This summit could be used to inform the community regarding the purpose of the listing of potentially eligible historic landmarks, and generate additional new ideas for maintaining a healthy balance between new development and preservation in the future. As a city, we have never gotten to the point of having a common plan for preservation, and one is greatly needed. The number of significant historic buildings is limited. Once they are gone, they are gone forever. The mayor will recommend to the Council that the city code allowing for certain exemptions from the requirement that approved site plans for new construction be in place prior to granting a demolition request exclude designated landmarks and potential landmarks from such exemptions. Various properties of historic interest along 5th Avenue North will be assessed by the City for potential landmark designation. The mayor will continue to support the initiation of landmarks by the city and endeavor to initiate a minimum of three applications for new landmarks yearly. 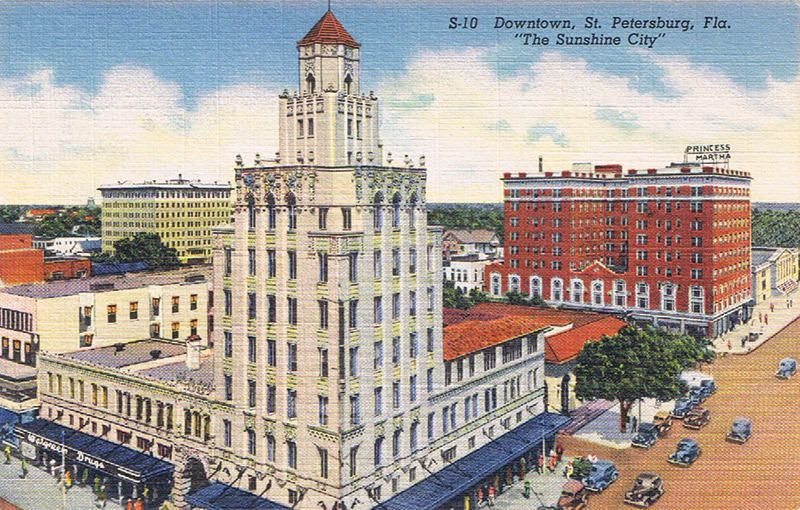 The City will conduct in 2016 a public historic Preservation Summit seeking ways the city can continue to protect and reuse historic resources to keep St. Petersburg special and contribute to the economic vitality and growth of the city. Make an archival record of the Pheil Hotel & Theater and Central Bank Building for purposes of future study. Preserve the historic clock on the property site. Provide a bronze plaque to commemorate the former presence of the Central National Bank and Phiel Hotel & Theater after demolition. 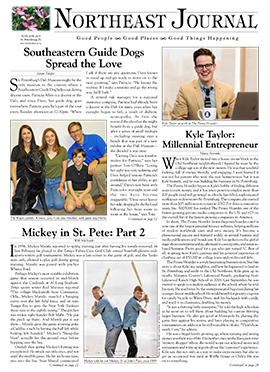 Sources used in this article include City of St. Petersburg, “Mayor’s Historic Preservation Summit,” June 24, 2006; “List of Potential Historic Landmarks,” January 27, 2011; “Update to the List of Eligibility,” March 8, 2016; “Staff Report, HPC 16-90300002” May 10, 2016; St. Petersburg Area Chamber of Commerce, Correspondence, February 9, 2015.